Daring the often dreaded traffic on the Southern State Parkway on Long Island NY. 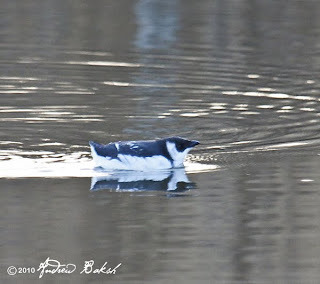 I made the mad dash late this afternoon for a Dovekie (The Little Auk, or Alle alle, is a small auk, the only member of the genus Alle) that was reported to be at the Suffolk County Timber Point Park West Marina. I made it with just minutes of light remaining thanks to my friend Shai Mitra, who helped me with directions. It was amazing watching the Dovekie swimming so close in the most unusual of places. I thought several times that someone would jump out of the phragmites with a remote yelling "gotcha"...it was so unreal. To show how bird watching can be so fascinating and unpredictable, while watching the Dovekie, I heard a Carolina Wren calling. I wonder how many people have experienced that? If the bird stays around, I would like to return with decent light for better photos, but here is one that is recognizable even with the low light. 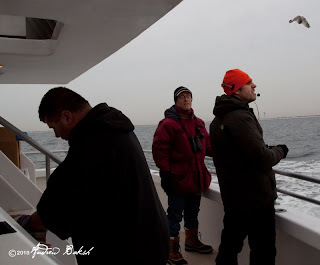 When I saw an e-mail about the Sea life Pelagic Trip out of Freeport Long Island NY, I made some inquires with some of my birding friends on their thoughts about the trip. Specifically, I spoke with Shai Mitra and Pat Lindsay, who both recommended the trip. Unfortunately, neither of them came out with me on Sunday January 17th for the 8 hour trip in the Atlantic Ocean. Joining me on the trip was Corey of 10000birds. After picking up Corey, in Queens we made short work of the ride out to Freeport and were boarding the boat with about 15 minutes before departure. Good thing we got there when we did because once we boarded and entered the Cabin, it was obvious that we had a decent size group. 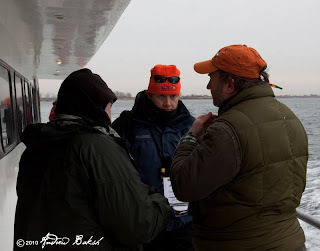 I was immediately drawn to voices going over species count and espied members of the "Jones Beach Boys" (as they are fondly referred to), doing their usual wrangling on who had more species for their year list. There were many familiar faces from the birding community; as well as, some that I met for the first time like Carrie, from Great or Greatest Auk. 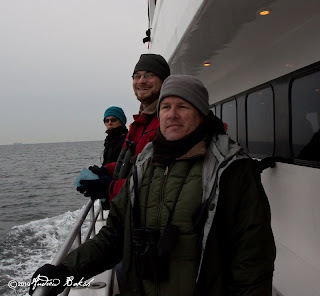 One thing was certain, there was a lot of talent on board and if there were birds around, these talented birders were going to spot them. After some announcements on how to properly get sick :) and other stuff like watching out for birders stampeding, we were off. 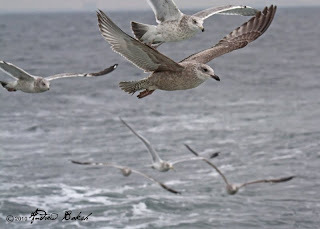 As soon as we were a few miles off shore the "chumming" began. Chumming, involves the use of food such as tuna, popcorn or other bait to attract the target species near the boat. Watching from the back of the boat, I got to see how effective it was in bringing in birds. Here are some teaser photos, that gives you an idea on the traffic following us. Check back for part II of the trip. 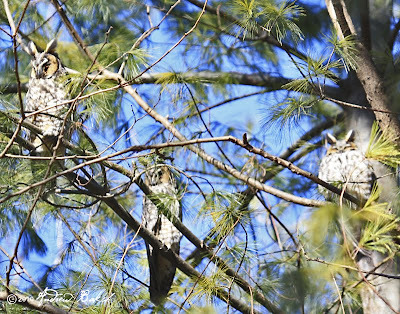 After talking about it for some time, my friend Eva finally decided to go birding and invited, Guy, Denis and I to go along on a birding day, (January 16th), that would take us to a couple of locations in search of Owls, Eagles and a Yellow-headed Black bird. 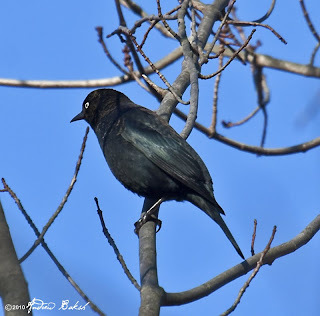 We ended up not getting the Yellow Headed Black bird at Pruyn Sanctuary in Millwood NY where the bird was reported. Also missed was a Red-shouldered Hawk that was seen earlier that morning in the nearby vicinity. We did get a couple of Rusty Blackbirds and ended up picking up several species for our day list including target birds like, Short-eared Owls, Bald Eagles, and Orange-crowned Warbler a nice bonus was a neat looking dark Morph Rough-legged Hawk. 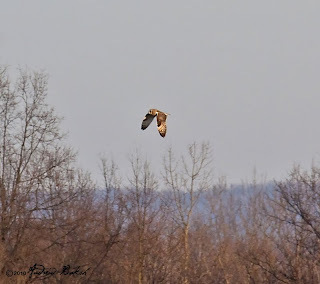 We had a high number of Red-tail Hawks with the tally being 26 for the day. Also in high numbers were Northern Harriers which tallied at 9 that included a “Grey Ghost”. We finally called it a day when the light began to fade and talked about another outing, hopefully that will occur sometime soon. Known as "the worlds least known bird species", researchers for the Wildlife Conservation Society have discovered for the first time the breeding area of the Large-billed Reed warbler in the remote and rugged Wakhan Corridor of the Pamir Mountains of north-eastern Afghanistan. The Large-billed Reed warbler was first discovered in India in 1867 and rediscovered a century later on March 27th, 2006, by ornithologist Philip Round, an Assistant Professor in the Department of Biology, Mahidol University while banding (bird ringing) in Thailand. This rediscovery is extremely exciting news as nothing was previously known about the Large-billed Reed warbler. Finds like this gives hope to ongoing searches for a number of species believed to be either extinct or on the verge of extinction. Who knows what else is out there to be discovered or rediscovered. 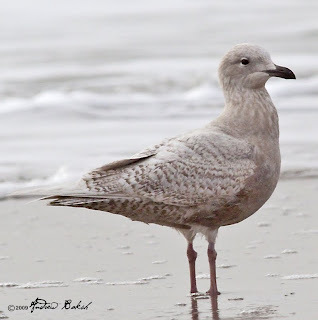 Following the Southern Nassau County and Captree Christmas bird counts, I decided the following weekend (January 10th), to try for some of the birds that I did not get to see on the counts. I thought I had gotten out early enough 6:45 a.m, but started to think otherwise when I began to pickup birds flying over the Southern State Parkway on Long Island. The best was a Great Egret that flew over right at the Hempstead Lake exit, a bird that I don’t think was found during either CBC’s. I wondered aloud where it had been hiding. 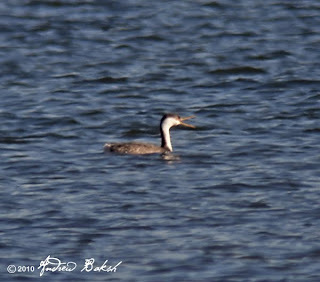 Dismissing all negative thoughts that my 1st target bird was going to be missed I continued on to Belmont Lake State Park. When I got there a couple of birders were there and upon inquiring if they had seen the Greater White-fronted Goose, I learned they had not. About 20 minutes after I had arrived, I spotted a Greater White-fronted Goose way in the back up against the Island hidden in between Canada Geese. 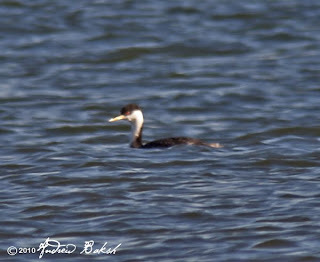 Later on, I found a second Greater White-fronted. By then other birders had begun to arrive and with them were my friends Shai Mitra and Pat Lindsay. 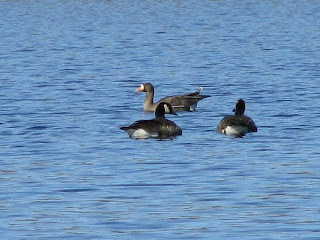 One birder earlier had tried to get us on a Cackling Goose, but we could not find it and he kept losing it. Shai, quickly found the Cackling Goose and got us all on the bird. Leaving Belmont, I diverted to another location to get some friends on a couple of birds they were looking for. 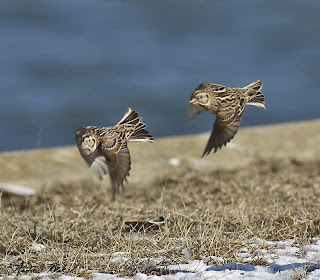 After completing that run successfully, I went for my second target bird, the Lapland Longspur that was seen at Floyd Bennett Field. When I got to Floyd Bennett, I headed for the cricket field and did a thorough search, but all I came up with were 36 Canada Geese, one of which had a banded orange collar (I have requested and awaiting information on the banded bird). From the cricket field I decided to check out the boat ramp for Gulls. After spending some time with the Gulls and enjoying a brief respite, I headed back to the cricket field. There I met Karlo Mirth, who you might remember from the Golden Plover post last summer. Karlo indicated that it appeared a flock of Snow Buntings had just flown onto the field. After thanking Karlo, I grabbed my gear and proceeded to scope the field. 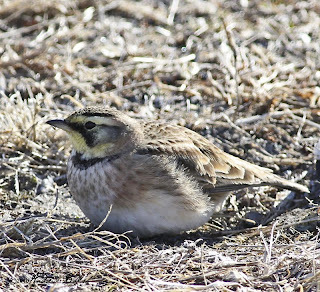 These turned out not to be Snow Buntings; instead, I counted a flock of about 48 Horned Larks as well as not one, but two Lapland Longspurs. After a while I left Karlo and his wife to enjoy the flock. It was time to move on and I was feeling quite pleased as I had just gotten target bird number 2. 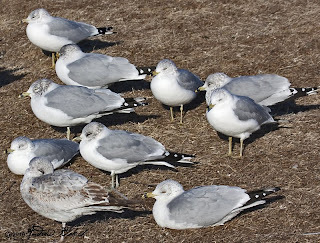 There is a Mew Gull in this group. Can you find it? 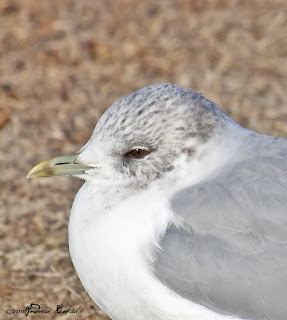 The last stop in my itinerary was to go after the BrooklynMew Gull. Having had the bird the first day it was found, I had dipped on it on New Year’s Day, but I was feeling lucky. I was hoping not only to see it, but to get some additional photos, since my initial photos were taken amidst rain and wind. 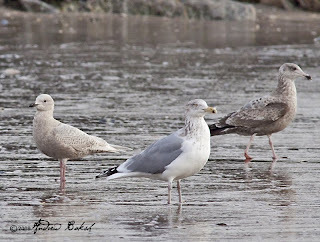 I got to the location where the bird was seen and after about 10 minutes, I located the bird within a flock of Ring-billed Gulls. 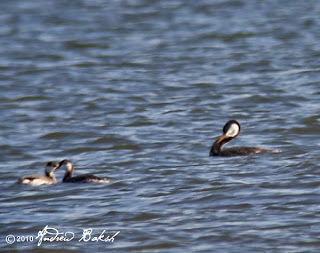 I was able to observe and photograph the bird despite the flock being flushed several times by dog walkers and bikers. 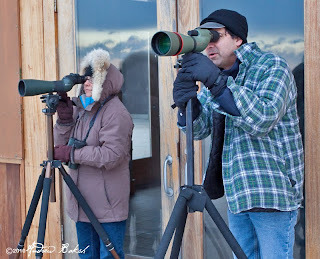 I was also able to get a couple of birders from NJ on the bird. This was one of those days that will be hard to duplicate in the field. 3 target birds and I got them all. 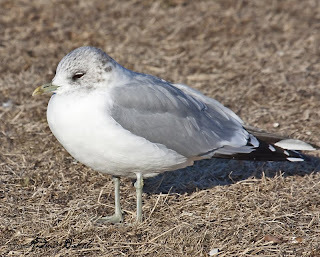 Now that there is a report of a possible Mew Gull in NJ, I thought of posting more photos of the Mew Gull in Brooklyn that might help as a field reference. Click on the images for a larger view. Enjoy! Maybe, the title of this post should have been, "Shane Blodgett has done it again". 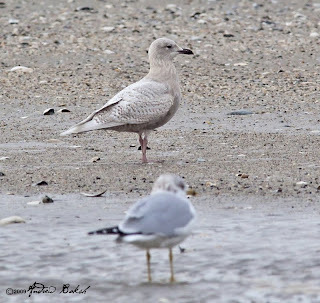 Like he did in finding the still ongoing Common/Mew Gull (see my post here), Shane has found another great bird for Brooklyn and NY. 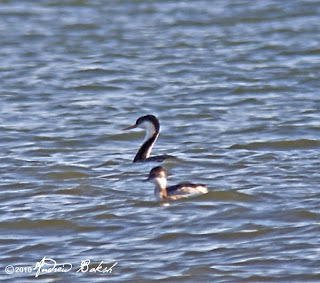 A Western Grebe, which he found just east of the Coney Island fishing pier in Brooklyn this morning. I was out and about, when I got the call from Shane but quickly diverted and headed over to the location of the bird. I enjoyed decent binocular and good scope views with a number of other birders (see photo above) who also came out to get this rarity. Below, are some digiscoped shots I have uploaded. 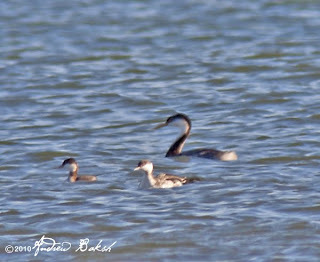 Western Grebe on right tucked in. 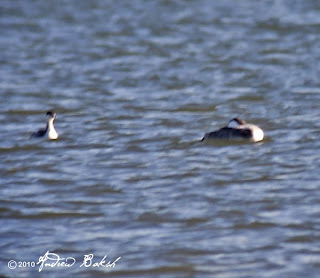 Western with two horned Grebes. 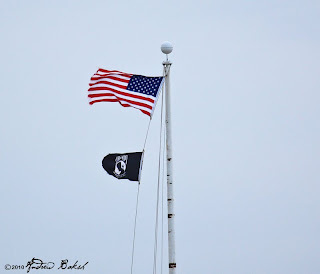 The flags at Fire Island gives an idea of how windy it was that day. 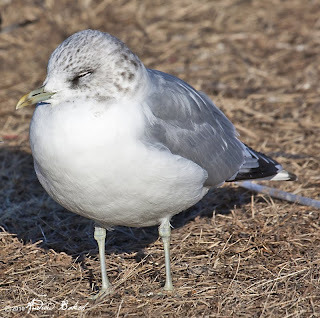 Following the Southern Nassau County Christmas Bird Count, I returned the next day, January 3rd, to Long Island for more punishment…er, I meant the Captree Christmas Bird Count. I found out that this was the 48th year for the count since its inception in 1962. The weather was worse than the previous day. On the beach, the wind gusts were averaging well over 26 mph, maxing out at probably around 45-48 mph. I met Patricia Lindsay and Shai Mitra around 7:15 a.m. and after picking up our permits required to access the fields that were closed, we began our day by birding Fire Island at Robert Moses State Park. Our first objective was a sea watch. When we got to our first sea watch location, the wind was blowing so hard that we had to hold on to the doors of our vehicles as we opened them for fear they would get ripped off. Pat unfortunately had her scope blown over in the parking lot; thankfully, only the body was a bit bruised and the glass remained intact with no damage. Shai and Pat trying to stay out of the wind during a sea watch. 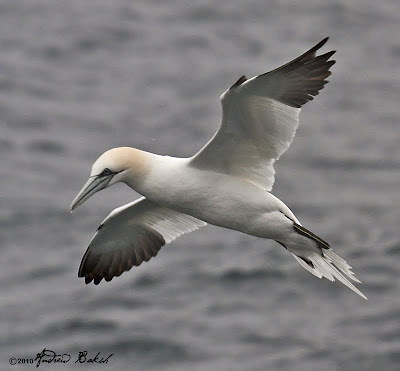 We found a spot that offered some shelter out of the wind and did our sea watch, picking up several species including all three Scoters, Gannets, Loons and lots of Long Tailed Ducks. Surprisingly, we did not get a Common Eider during that watch. Then it was time to split up; I was supposed to bird Democrat Point with Shai. 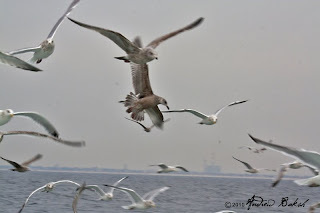 However, after the boat stint during the Southern Nassau County Christmas Bird Count, Pat was not having any of it. She insisted that I bird with her away from the water and wind indicating that I had paid my dues the day before (see my post on Southern Nassau County Christmas Bird Count)and Shai too agreed with her. It was two against one and so I acquiesced, knowing they meant well. 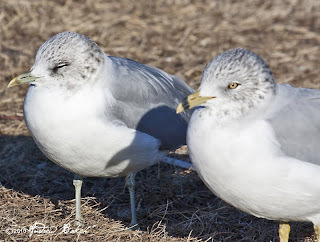 It was settled that, Pat and I were going to bird Connetquot State Park, while Shai was going to Democratic Point and then continue to bird Fire Island. 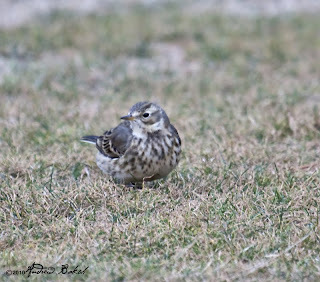 On our way out of Fire Island, Pat and I birded the median around fields 2-6 and found a few birds for our list; the best sighting and quite the surprise were around 26 American Pipits. We also picked up our first Common Eider of the day when we stopped at one of the fields to do a quick sea watch. Tom Burke and Gail Benson helping out at Connetquot State Park. Over at Connetquot State Park, we were joined by Tom Burke and Gail Benson. Tom was not feeling too well, but was sticking it out. 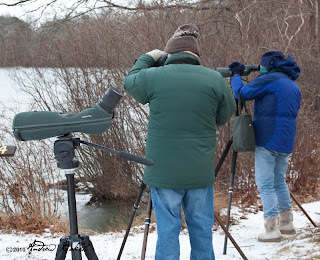 Such is the dedication of these hardy birders. After scoping out and documenting the species on the pond, Pat and I worked the trails adding a number of species to our list. 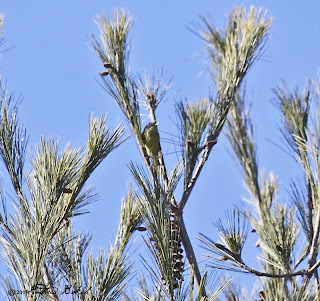 Our best find was a Pine Warbler, which might have been a save for the count. 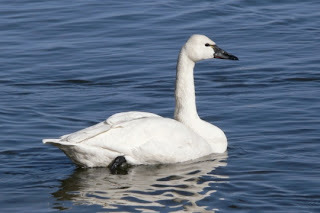 We also had a Tundra Swan, which I believe was the only one for the count. After several hours at Connetquot State Park, we joined Shai for a short lunch break where we reviewed our numbers and planned our strategy for the rest of the day. After lunch, Pat and I continued to hit spots that were on our assigned route and checked in with other teams to see if they needed help. We learned that teams working the beach fronts were having a torrid time, with heavy wind and swirling sand. Around 3:30 p.m. we rejoined Shai at Fire Island for a final sea watch; we were hoping for a Razorbill, which had eluded us for the day. Alas, the Razorbill was not to be and after about 45 minutes we called it a day. A few of the intrepid birders enjoy dinner after a long day in the field. 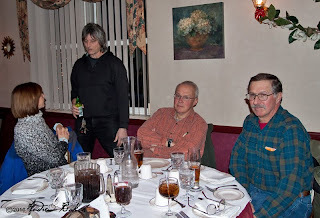 Dinner and compilation was held at Villa Monaco in West Islip. The dinner crowd was not as large as the one for Southern Nassau County, but we had a decent turnout. Our compilation went well and it turned out 109 species were recorded (plus one additional distinctive subspecies), a total well below the count’s 20-year average of 116 species. However, given the weather conditions, everyone present felt the results were quite impressive. It was another tough day for birding, but I thoroughly enjoyed every bit of being out with a great bunch of people all contributing to citizen science. On Saturday January 2nd, I along with 49 other participants helped out with the 70th Southern Nassau County Christmas Bird Count. My assignment was boat duty, which was not an easy task given the weather conditions. The boat was managed by veteran mariner John Zarudsky who works for the department of Conservation and Waterways at Point Lookout in Long Island. In our first outing, we worked our way through Sea Dog Creek, High Meadows, Smith Meadows and Middle Bay. With the wind it was rough going in the open areas and we bounced around a bit with the skiff, but John handled it beautifully. Unfortunately, I got wet and so after about 2 hours, when I could no longer feel my toes, we came back to land where I dried off and warmed up. After about half an hour, we debated on whether to go back out; the folks at the office thought we were nuts to go back out again, but John and I were determined to get as many species as we could from the boat and so we went at it again. Our second outing took us to the West Bay and Black Banks. After about an hour we decided to call it a day on the water due to gusty winds and a fast dropping tide. We concluded that the birds were much smarter than the CBC counters and were laying low staying warm. The boat run was quite the adventure and looking back I am not sure it was the smartest thing we did going out in those conditions. After our boat run John and I joined Shai Mitra, Pat Lindsay and a couple of other counters at the Marine Study Area in Oceanside LI where we reviewed our numbers. Later, most of the teams gathered at Otto’s Sea Grill in Freeport LI for dinner. It was a good turnout and I marveled at the talent that was present. 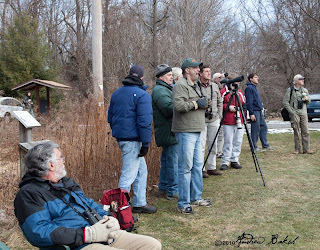 Arguably, the folks in that room were some of the most talented birders/naturalists/photographers in the state of New York. 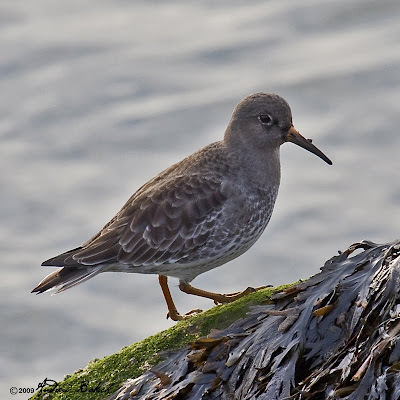 In all 121 species were recorded (plus two additional distinctive subspecies), a total I later learned that was well below the recent average of 128 species. The numbers were chalked up to the winds and snow showers that interfered with the count. Species recorded during the count week, included: Willet, Great Horned Owl, Chipping Sparrow, and Rusty Blackbird. Despite the weather it was a great effort by all who participated in getting that many species and I was glad to be a part of the event. I have been busy the last few days with Christmas Bird Counts and so have not had a chance to post on my new year's day birding. 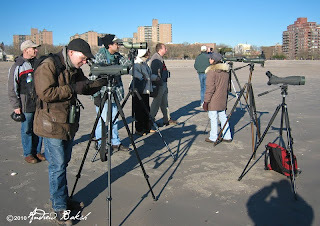 On January 1st, I got off to a late start for some New Year's birding that first took me to Fort Tilden in Queens NY. The land birds were scare, but I managed a few for my year list, including a Catbird, which is a rare commodity this time of the year. 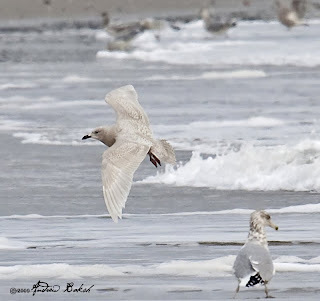 My best bird of the day was an Iceland Gull that I found near the Fort Tilden fisherman's parking lot. 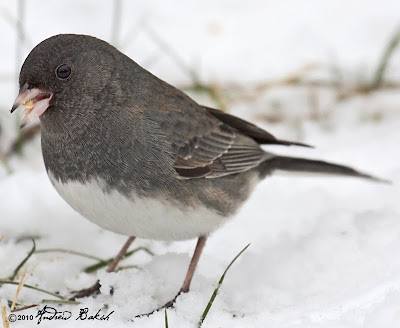 It appeared to be a first winter bird, which I got to observe and photograph. 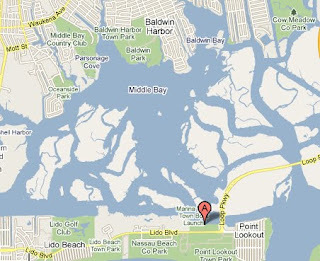 Later in the afternoon, I tried for and missed the Mew Gull that has been seen in Bensonhurst Park Brooklyn. 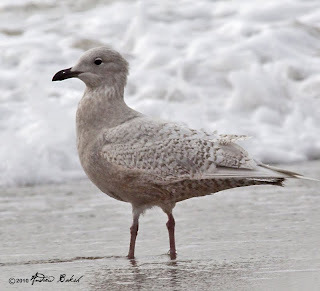 Hope you enjoy some of the photos I have posted of the Iceland Gull.